Enjoy Skyway, a 5 reel, 20 payline video slots game that includes a whole range of lettered symbols for you to match up and earn yourself a whole range of free spins and cash rewards. 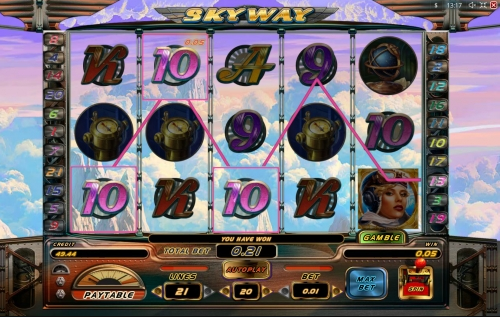 Soar high above the clouds during this online slot game and enjoy the serene atmosphere of an unearthly stratosphere. Join today! Playson was established in 2012, and already they have taken the iGaming industry by storm. This new company has already expanded their business and employs over 250 staff members world-wide, and has formed business partnerships with some of the leading names in the industry. They have over 30 high definition casino slot games in their portfolio with many more in the pipeline, each bursting with technological innovation and thematic creativity proving that this is a name worth keeping an eye on. It’s up, up and away with Sky Way! Take to the skies and join the pioneering aviators in this beautiful adventure slot game. Set way up high in a cloudy paradise, this slot game is not for those afraid of heights as you will be soaring through the skies. You can start your aviation adventure from as little as 21p up to £105 per spin in this 5 reel, 21 payline slot game. The reels are presented as if they were part of the pilot’s cockpit, showing all the dials and controls required to fly your game into winning jackpots. The reels themselves are filled with symbols and paraphernalia from the pioneering days of aviation and include inventors, mechanics, globes and navigation instruments. You also have your standard car playing symbols of 9 – 10, A, K, Q and J, as these are the most common to appear they represent the lowest paying symbols. The beautiful Female Pilot is the highest paying symbol, find 5 of her on an active payline and you will receive a massive 9, 000 times your line bet! The Pilot is the Wild in this aviation adventure slot game, he will substitute for all other symbols bar the Airship Scatter to help you with those winning combinations. Find 3 or more Airship Scatters to trigger the Free Spins feature where you will be rewarded with 16 Free Spins. If you find 3 or more Airship Scatters in the Free Spins feature you will be rewarded with an additional 16 Free Spins, and the Scatter will act as an Extra Wild! Easy game! After each successful spin, you also have the chance to play a Gamble Game of double or nothing. If you decide to play, you are dealt a card where you have to guess the colour to double your triggering winnings. You could also bet on which suit the card is to quadruple your winnings. However, if you guess incorrectly you forfeit the bet and return to the game. Visit EasySlots.com for more slot promotions!